Well, OK, I don’t know if I ever heard you say “Son, use a real edger!” and I can’t say for certain that I ever saw you try to use a string trimmer to edge your driveway or sidewalk. But I know you had a real edger (it was green and black) when we lived on Denton Ave. and I’ve struggled enough trying to use a string trimmer to edge so I gave up a few years ago. For fathers’ day, my extremely perceptive family picked up on my hints and I got a Black & Decker “edge hog”. Thank you! Thank you! Thank you! 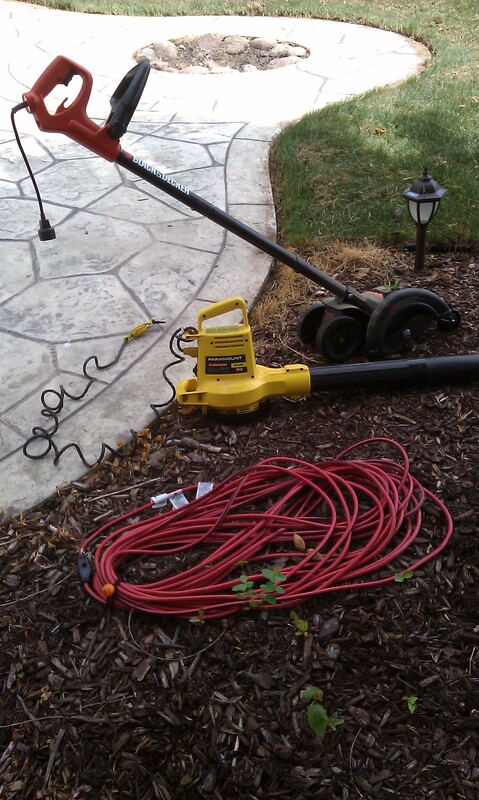 A half hour in the hot sun and my driveway and patio are edged like a pro would edge them, with the help of the edge hog, my electric tornado and a nice heavy duty extension cord. Thanks for the advice Dad! Your driveway and walk next week? FTC 16 CFR, part 255 Disclaimer: The Black & Decker “edge hog” link above is an affiliate link to Amazon.com. If you click the link and buy the product from Amazon, I may earn a few cents. I only link to things I use and truly believe are great products, in hope that someone who reads my blog will also find them useful. This is not a significant source of income for me and the few cents I may earn does not in any way influence what I link to.